Congratulations to the members of our Housing Consumer Education Center Team on their recent certifications! 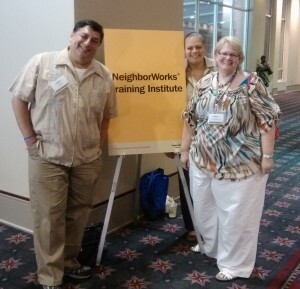 Pictured is Robert Ochoa, Housing Counselor Specialist;Â Madeline Cotto, HCEC CoordinatorÂ and Pam Moshier, Chief Consumer Education Officer and Director of HCEC at theÂ NeighborWorks Training Institute in Philadelphia PA.
Robert and Maddie are now certified in Homebuyer Educaton Methods as Trainers andÂ Pam received Certification in Homeownership Counseling for Program Managers and Executive Directors. For more information on our Housing Consumer Education Center, please visit our HCEC Page on our website. About NeighborWorks Center for Homeownership Education and Counseling: Â NCHEC promotes sustainable homeownership by supporting the industryâ€™s educators and counselors. Through its training programs, professional certifications and other tools and resources, NCHEC increases the number of qualified homeownership professionals who are prepared to help people realize the dream of lifelong homeownership. Â Visit their website for more information. This entry was posted in Blog, Economic Development, General Interest, Uncategorized and tagged advocacy, Clients, community development, Customer Service, Economic Development, Education and Training, Federally Funded programs, HCEC, Housing, Housing Needs, RCAP Solutions. Bookmark the permalink.